Detroit’s Belle Isle Park is a big place. 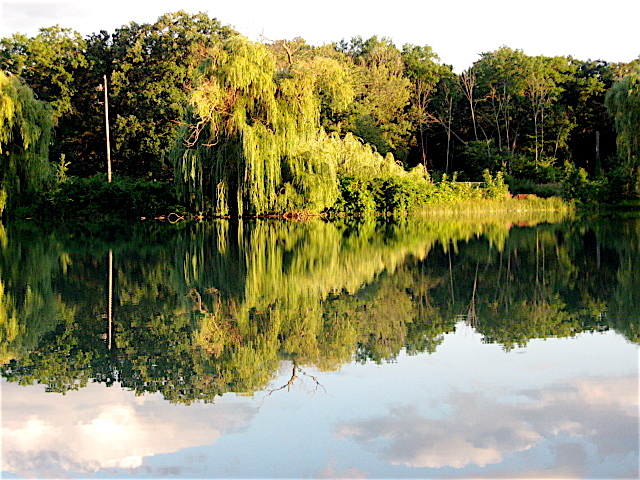 It spans about 950 acres, and it includes woodlands, canals, and small inland lakes and ponds. It is located in the middle of the Detroit River, one of the busiest waterways in the world. Canada is on the south side of the island and the city of Detroit is on the north. It is the largest island park of its kind in the U.S., and it was designed in the 1880s by Fredrick Law Olmstead, the same landscape architect that designed New York’s famous Central Park. In addition to the winding streets and pathways that cut through the interior of the park, there is an outer ring road that circles the island. It is a 5-mile loop around the island starting and ending at the foot of the Belle Bridge that connects the island to Detroit’s mainland. It’s a beautiful, leisurely ride on a bicycle, especially in the early morning or late evening. 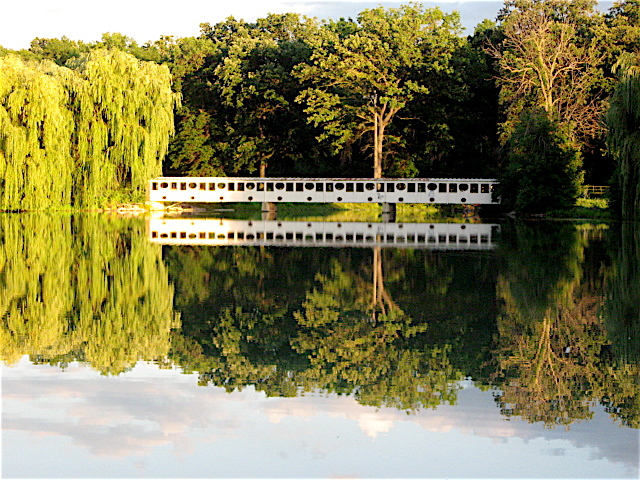 On the Northeast side of the island is a good-sized inland lake with beautiful blue water. 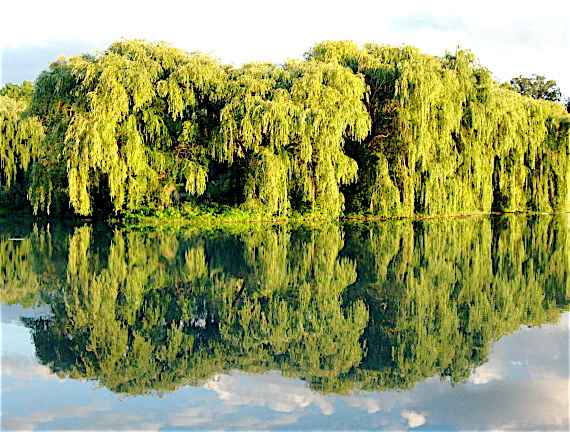 Lining the shore of the lake are big, bushy Weeping Willow trees that stand around 70 feet tall. When I rode by there the other evening on a casual bike ride, the lake was still and calm, without a ripple to be seen. Looking at the northeast end of the lake as I rounded a corner, I was immediately in awe of what I saw. 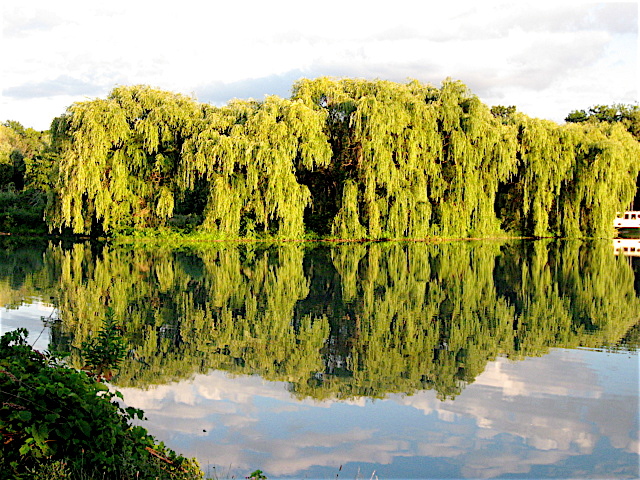 The gently setting sun had highlighted the water’s deep blue color, and reflecting across the smooth surface was the vibrant green Weeping Willow trees. The reflections were a perfect crystal clear mirror image of what was growing on the banks of the lake. 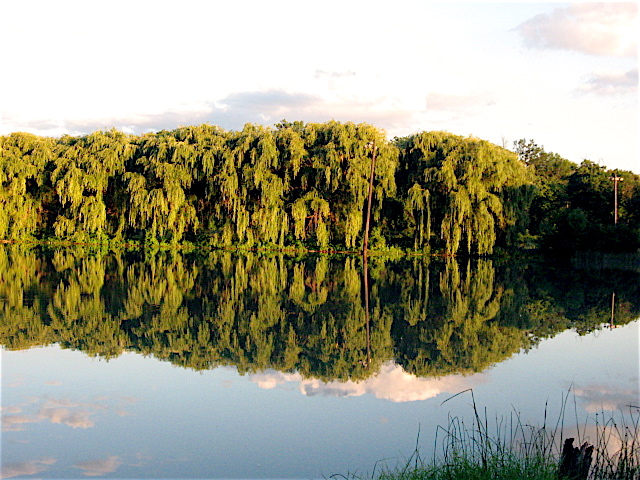 The reflections of the lake-lined trees were dreamlike in their beauty and surreal in their appearance. As the sun drifted lower, the effect slowly faded. 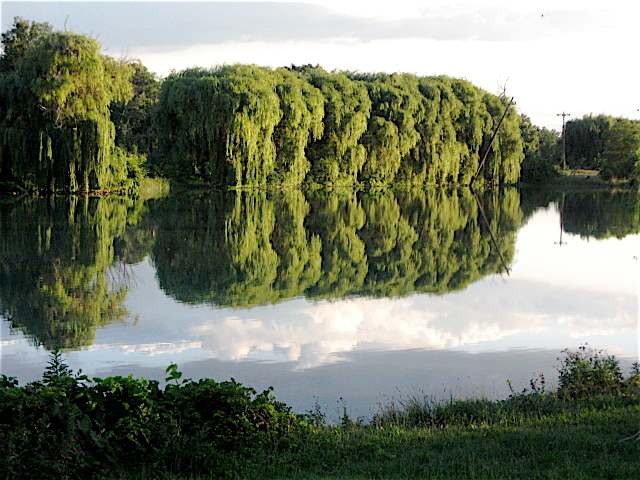 Here is a sampling of what I saw on that little lake on the island as I slowly pedaled by.